“S” Is For Sox Tickets – or Sucker, You Decide (61/365 v2.0) – Annoyingly Boring? I paid $50.00 per ticket for a Sox/Yankees game. Obstructed view. If you know Fenway Park, you know that they usually mean it, big time. The Sox don’t discount obstructed views at all. But, the game is on my birthday and I figure I will treat the tickets like standing room if the seats are terrible. Last major league baseball game I went to, general admission tickets cost $6. Yeah, that was a long time ago… 1982, Anaheim Stadium. 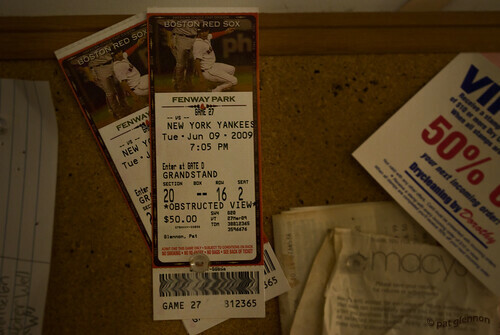 American League Championship tickets that year were $12 for a reserved seat.